A line of fluorinated grip waxes optimized for the requirements of classic racing these days, which means usually either double poling of aggressively "running" uphill. Frequently used in World Cup races by many national teams. 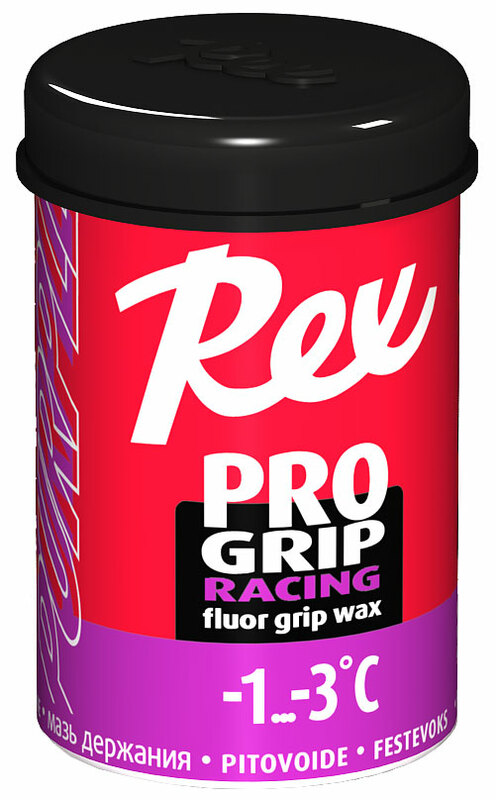 When you are looking for a race-day grip wax with best possible gliding properties, ProGrip is the correct choice! Recommended to be used in especially in wet and moist conditions when fluor reduces icing and improves gliding properties. The coldest wax in the collection to be used in all snow conditions. This can also be used as a cover for ProGrip Blue. The legendary Rex blue spiced up with a pinch of fluor. Works on all conditions below zero. The choice for mild frosts. At its best on moist snow. Makes a great cover for purple klister on coarse snow. Rex’s legendary "one to one". This is an unique wax for demanding conditions around 0°C. Can be used as an alternative for klisters with excellent anti-ice properties. One of Rex’s most popular grip waxes. Makes a good combination with Universal klister.